This is the fourth article in a series on metabolomics, which is a major development in -omics, integrating transcriptomics, proteomics, genomics, metabolic pathways analysis, metabolic and genomic regulatory control using computational mapping. In the previous two part presentation, flux analysis was not a topic for evaluation, but here it is the major focus. It is a study of yeast cells, and bears some relationship to the comparison of glycemia, oxidative phosphorylation, TCA cycle, and ETC in leukemia cell lines. In the previous study – system flux was beyond the scope of analysis, and explicitly stated. The inferences made in comparing the two lymphocytic leukemia cells was of intracellular metabolism from extracellular measurements. The study of yeast cells is aimed at looking at cellular effluxes, which is also an important method for studying pharmacological effects and drug resistance. 3. Metabolomic analysis of two leukemia cell lines. II. Q2. What measurements were excluded from the previous study that would not allow inference about fluxes? Q3. Would this study bear any relationship to the Pasteur effect? Q4 What is a genome scale network reconstruction? Q5 What type of information is required for a network prediction model? Q6. Is there a difference between the metabolites profiles for yeast grown under aerobic and anaerobuc conditions – under the constrainsts? Q7. If there is a difference in the S metabolism, would there be an effect on ATP production? © 2009 Mo et al; licensee BioMed Central Ltd.
quantitative identification of physiological and disease-induced biological states. can provide an insightful view of intracellular physiological states in a noninvasive manner. to study systemic changes in intracellular metabolic states. and includes 904 genes and 1,412 reactions. a flux sampling approach was used to characterize candidate flux distributions allowed by these constraints. on intracellular metabolite levels and fluxes. the metabolic network that were perturbed. enables inferring changes in intracellular metabolic flux states. related to human physiological and disease states. at varying levels of biological detail. accompanying databases that compile this information. genome-scale metabolic networks for various microbial and eukaryotic organisms [1–11]. interactions specific to each organism. determined to exist and operate within a particular organism. governing physico-chemical and genetic constraints [12,13]. different environmental and genetic conditions . to explore the metabolic flux space. uniform random sampling of steady-state flux distributions . constraints imposed on the network. to identify candidate disease states in the cardiomyocyte mitochondria . including transcriptomic, proteomic, metabolomic, and fluxomic data. intracellular and extracellular metabolite level measurements [20,21]. various “upstream” control mechanisms of metabolic processes. by cells under different conditions. without disrupting the cell itself. unicellular model organisms to human biofluids [20–23]. involved in the production and utilization of extracellular metabolites . provide insight into the intracellular pathway activities related to metabolite secretion. characterizing gene functions in yeast [24–27]. quantitative changes in secretion profiles. that define observed metabolic behavior. in mutant strains with respiratory deficiencies . together with an optimization-based method well suited for such data. for a larger number of secreted metabolites. large-scale characterization of mutants strains using metabolite profiles. are linked to global changes in intracellular metabolic flux states. used in the previously mentioned study . in order to identify dominant metabolic features that are collectively perturbed (Figure 2). optimization-based methods and can effectively be used – in biofluid metabolome analysis. Figure 1. Schematic illustrating the integration of exometabolomic (EM) data with the constraint-based framework. (A) Cells are subjected to genetic and/or environmental perturbations to secrete metabolite patterns unique to that condition. (B) EM is detected, identified, and quantified. (C) EM data is integrated as required secretion flux constraints to define allowable solution space. (D) Random sampling of solution space yields the range of feasible flux distributions for intracellular reactions. which metabolic regions were altered between the two conditions (see Figure 2). (F) Significantly altered metabolic regions were identified. Figure 2. Schematic of sampling and scoring analysis to determine intracellular flux changes. (A) Reaction fluxes are sampled for two conditions. to obtain a distribution of flux differences for each reaction. how far the sampled flux differences deviates from a zero flux change. analyzing reporter metabolites and subsystems. two yeast EM data sets using a constraint-based sampling approach. of intracellular metabolite levels and fluxes [31,32]. ammonium and potassium concentrations . ammonium excess conditions to one another. to changes in intracellular metabolic network states. Additional file 1. iMM904 network content. detailed information on the expanded content. Additional file 2. iMM904 model files. can be loaded into Matlab using the ‘SimPhenyPlus’ format with GPR and compound information. The network reconstruction was converted to a constraint-based model using established procedures . containing the stoichiometric coefficients of the reactions in the network. where v is the reaction flux vector. corresponding to the experimental measured substrate uptake rates. utilizing the glpk or Tomlab/CPLEX (Tomopt, Inc.) optimization solvers. on substrate uptake and byproduct secretion in these conditions . The study was performed following the approach taken to validate the iFF708 model in a previous study . and minimizing the glucose uptake rate. and results are shown in Figure S1 [see Additional file 3]. Additional file 3. Supplemental figures. The file provides the supplemental figures and descriptions of S1, S2, S3, and S4. setting the flux through the corresponding reaction(s) to zero. with the assumed fractional contribution of 10-.
the inclusion of additional essential biomass components . and oxygen uptake to 2 mmol/h/gDW. Ammonia, phosphate, and sulfate were assumed to be non-limiting. at non-limiting, but low levels. were supplied in the simulations . a linear version of MoMA (linearMoMA). and the knockout strain flux solution). (viable/lethal) from a previously published experimental gene deletion study . a deletion strain that is considered to be viable. results shown in Figure S2 [see Additional file 3]. without requiring arbitrarily choosing this parameter a priori . (i.e. 100% true viable rate, 0% false viable rate). MCC, Matthews correlation coefficient (see Methods). Note that the iLL672 predictions were obtained directly from  and thus the viability threshold was not optimized using the maximum MCC approach. the optimal viability threshold based on this criterion. using the Matthews Correlation Coefficient (MCC) . in our case where there are substantially more viable than lethal gene deletions. ROC plots were produced in Matlab (Mathworks, Inc.). to the quantitative ranges of intracellular reaction fluxes required to produce them. (at a steady state) – into the extracellular media. for various environmental (i.e. substrate uptake) conditions . inherently accounting for sampling calculation sensitivity. for the gdh1/GDH2 strain study. sterols and fatty acids were provided as in silico supplements as described in . to mimic experimental chemostat cultivation conditions. differed based only on variations in the output secretion constraints. based on the EM-constrained metabolic models. given the two sets of constraints. by assuming minimal rerouting of flux distibution between a perturbed network and its reference network. between the mutant and wild-type flux distributions. defined by the constraints described above. were discarded from further analysis as these reactions can have arbitrary flux values. The following sections describe the approaches used for the analysis of the different datasets. did not produce significant biomass. for the condition as determined by FBA. may not correspond to maximum biomass production . ranging from 50% to 100% at 5% increments. and maximum rate of 1.0 mmol/hr/gDW). a flux distribution was stored every 5000 steps. the exact scaling of secretion rates. for the highest extracellular metabolite secretion rate (maximum 1 mmol/hr/gDW). without imposing the requirement of strictly maximizing a predetermined objective function. due to only random differences between sampling runs. we assumed that sampling of the optimal solution space was appropriate for this study. were combined in the final analysis. A Z-score based approach was implemented to quantify differences in flux samples between two conditions (Figure 2). the difference between the flux vectors was computed. for each pair of conditions considered (e.g. mutant or perturbed environment vs. wild type). between perturbation and wild type). 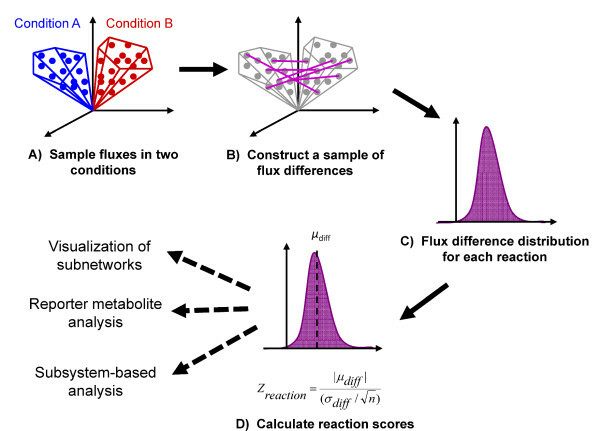 flux distributions inferred based on the extracellular metabolite secretion constraints. based on reporter metabolite  or subsystem  Z-scores. at the metabolite and pathway levels for a particular condition. its standard deviation for 1,000 randomly generated reaction sets of size Nj. that belongs to each subsystem k.
more significantly than what is expected by random chance. Perturbation subnetworks of reactions and connecting metabolites were visualized using Cytoscape . was used as the basis for the construction of the expanded iMM904 network. but has not yet been adapted for FBA calculations . increased in iMM904 compared with the iND750 network. reactions involving the degradation of sphingolipids and glycerolipids. to enable the completion of known physiological functions. based on experimentally observed secreted metabolites . to include additional gene products that are required to catalyze a reaction. the genes encoding these proteins were not associated with their corresponding GPRs. to sustain catalytic activity in cytochromes p450, respectively. their corresponding products necessary for a catalytic activity to occur. reactions in previous network reconstructions of E. coli [2,47]. reactions and metabolites specific to yeast. the elucidation of particular transport mechanisms. to analyze another S. cerevisiae metabolic model, iLL672 . reconstructing the iND750 network . as described in Methods and subsequently compared to the experimental data (Table 1). (maximum Matthews correlation coefficient, see Methods). for the subset of iMM904 predictions with genes included in iLL672 (reduced iMM904 set). at predicting growth phenotypes under the ethanol condition. thus the growth rate threshold was not optimized similarly to iMM904 predictions. compared with reduced iMM904 and iLL672 predictions. removed from iFF708 to build the iLL672 reconstruction . if the pathway is in fact required for growth under a certain condition [2,26]. we can expect false viable prediction rates to consequently decrease. provides a framework for network expansion as new pathways are elucidated . favor the NADPH-dependent fermentation of xylose. into glutamate using NADH instead of NADPH as a cofactor. under aerobic and anaerobic conditions. sampling-based approaches as described in Methods. were explicitly represented in the iMM904 network [see Additional file 4]. to compare and validate the intracellular flux predictions. considered to be significantly perturbed [see Additional file 4]. Additional file 4. Gdh mutant aerobic and anaerobic analysis results. The data provided are the full results for the exometabolomic analysis of aerobic and anerobic gdh1/GDH2 mutant. outperforms that of FBA optimization predictions in accurately predicting differential metabolites involved in perturbed intracellular fluxes. Table 2. Statistical comparison of the differential intracellular metabolite data set (p < 0.05) with metabolites involved in perturbed reactions predicted by FBA optimization and sampling analyses for aerobic and anaerobic gdh1/GDH2 mutant. sampling analyses for aerobic and anaerobic gdh1/GDH2 mutant. Overall statistics indicate combined results of both conditions. Figure 3. Perturbation reaction subnetwork of gdh1/GDH2 mutant under aerobic conditions. The network illustrates a simplified subset of highly perturbedPerturbation subnetworks can be drawn to visualize predicted significantly perturbed intracellular reactions and illustrate their connection to the observed secreted metabolites in the aerobic and anaerobic gdh1/GDH2 mutants. Perturbation reaction subnetwork of gdh1.GDH2 mutant under aerobic conditions. beyond just altering glutamate metabolism anaerobically. Interestingly, it is clear that the majority of the secreted metabolite pathways involve connected perturbed reactions that broadly converge on glutamate. production and secretion pathways are used by the cell for these metabolites. 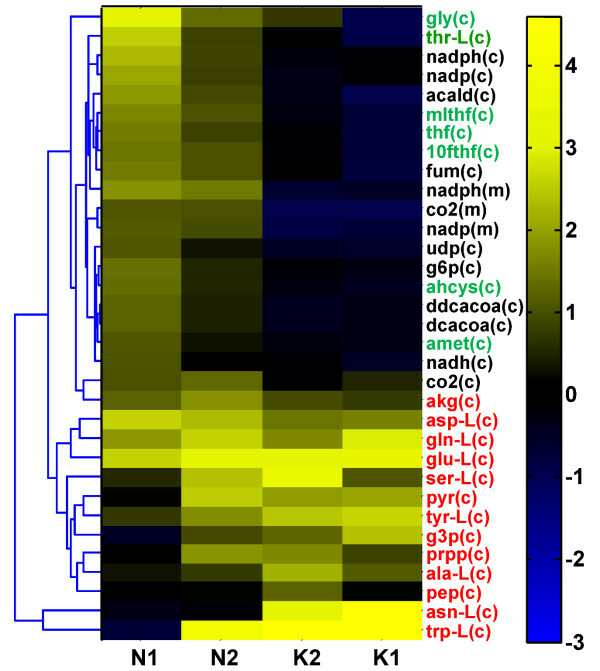 Reactions connected to aerobically-secreted metabolites predicted from the sampling analysis of the gdh1/GDH2 mutant strain. were also detected in the anaerobic condition. Metabolite abbreviations are found in Additional file 1. Perturbation reaction subnetwork of gdh1/GDH2 mutant under anaerobic conditions. Subnetwork illustrates the highly perturbed anaerobic reactions of similar Z-reaction magnitude to the reactions in Figure 3. A significantly larger number of reactions indicates mutant metabolic effects are more widespread in the anaerobic environment. suggests that the direct genetic perturbation effects are amplified under this environment. Metabolite abbreviations are found in Additional file 1.
reporter metabolites, and reporter subsystems is included [see Additional file 4]. Table 3. List of the top ten significant reporter metabolite and subsystem scores for the gdh1/GDH2 vs. wild type comparison in aerobic conditions. List of the top ten significant reporter metabolite and subsystem scores for the gdh1/GDH2 vs. wild type comparison in aerobic conditions. Table 4. List of top ten significant reporter metabolite and subsystem scores for the gdh1/GDH2 vs. wild type comparison in anaerobic conditions. List of top ten significant reporter metabolite and subsystem scores for the gdh1/GDH2 vs. wild type comparison in anaerobic conditions. alpha-ketoglutarate – were also identified. with concomitant changes in other central metabolic pathways. in the gdh1/GDH2 mutant according to the differential intracellular metabolite data. is certainly feasible as NADH is a primary reducing agent for ATP production. perturbed cofactor balance as a common, dominant effect under both conditions. the entry point for ammonium assimilation via glutamate. as a result of the gdh1/GDH2 modification in both aerobic and anaerobic conditions. with significantly changed intracellular and extracellular levels. has a more widespread effect under anaerobic conditions. which were predicted to be significantly perturbed only in anaerobic conditions. by threonine’s recently discovered role as a key precursor in yeast nucleotide biosynthesis . both of which are involved in the cytosolic folate cycle (one-carbon metabolism). is a key cofactor in cellular growth . their potential connection to perturbed ammonium assimilation processes. co-regulated with genes involved in glycine, folate, and purine synthesis . indirect effects through NADH/NADPH balance are more significant aerobically. and did not necessarily emphasize that glutamate dehydrogenase was the site of the genetic modification. 3) glutamate as the most significant reporter metabolite (Table 4). when ammonium was provided as the sole nitrogen source . resulting in excess ammonium uptake . in potassium-limited conditions as a means to detoxify the excess ammonium. but with excess ammonia in the environment. internal metabolic states in these conditions are potentially different. for a range of low potassium and high ammonia conditions reported in . finally summarized the resulting changes using reporter metabolites. obtained from this analysis across the four conditions studied. the significant reporter metabolites identified in the high ammonia environments. slightly weaker for the lower ammonium concentration. exists under both types of media conditions. Clustergram of top reporter metabolites (i.e. in yellow) in ammonium-toxic and potassium-limited conditions. abbreviations are found in Additional file 1.
metabolism when amino acid-related pathways are broadly affected. which in turn potentially impacts folate metabolism and associated cellular growth. metabolite profiles (e.g. only amino acids) are available. Conceived and designed the experiments: MLM MJH BOP. Performed experiments: MLM MJH. Analyzed the data: MLM MJH. Wrote the paper: MLM MJH BOP. All authors have read and approved the final manuscript. We thank Jens Nielsen for providing the raw metabolome data for the mutant strain, and Jan Schellenberger and Ines Thiele for valuable discussions. This work was supported by NIH grant R01 GM071808. BOP serves on the scientific advisory board of Genomatica Inc.
Duarte NC, Becker SA, Jamshidi N, Thiele I, Mo ML, Vo TD, Srivas R, Palsson BO: Global reconstruction of the human metabolic network based on genomic and bibliomic data. Duarte NC, Herrgard MJ, Palsson B: Reconstruction and Validation of Saccharomyces cerevisiae iND750, a Fully Compartmentalized Genome-Scale Metabolic Model. Kuepfer L, Sauer U, Blank LM: Metabolic functions of duplicate genes in Saccharomyces cerevisiae. Nookaew I, Jewett MC, Meechai A, Thammarongtham C, Laoteng K, Cheevadhanarak S, Nielsen J, Bhumiratana S: The genome-scale metabolic model iIN800 of Saccharomyces cerevisiae and its validation: a scaffold to query lipid metabolism. Edwards JS, Palsson BO: Systems properties of the Haemophilus influenzae Rd metabolic genotype. Edwards JS, Palsson BO: The Escherichia coli MG1655 in silico metabolic genotype: Its definition, characteristics, and capabilities. Thiele I, Vo TD, Price ND, Palsson B: An Expanded Metabolic Reconstruction of Helicobacter pylori (i IT341 GSM/GPR): An in silico genome-scale characterization of single and double deletion mutants. Vo TD, Greenberg HJ, Palsson BO: Reconstruction and functional characterization of the human mitochondrial metabolic network based on proteomic and biochemical data. Reed JL, Vo TD, Schilling CH, Palsson BO: An expanded genome-scale model of Escherichia coli K-12 (iJR904 GSM/GPR). Feist AM, Henry CS, Reed JL, Krummenacker M, Joyce AR, Karp PD, V H, Palsson BO: A genome-scale metabolic reconstruction for Escherichia coli K-12 MG1655 that accounts for 1261 ORFs and thermodynamic information. Suthers PF, Dasika MS, Kumar VS, Denisov G, Glass JI, Maranas CD: A genome-scale metabolic reconstruction of Mycoplasma genitalium, iPS189. Price ND, Reed JL, Palsson BO: Genome-scale models of microbial cells: evaluating the consequences of constraints. 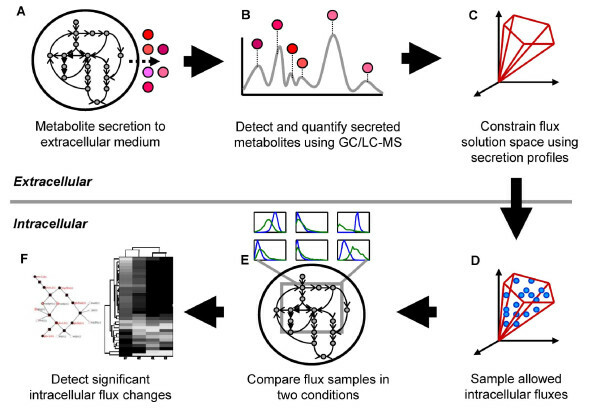 Becker SA, Feist AM, Mo ML, Hannum G, Palsson BO, Herrgard MJ: Quantitative Prediction of Cellular Metabolism with Constraint-based Models: The COBRA Toolbox. Reed JL, Palsson BO: Genome-Scale In Silico Models of E. coli Have Multiple Equivalent Phenotypic States: Assessment of Correlated Reaction Subsets That Comprise Network States. Fong SS, Palsson BO: Metabolic gene deletion strains of Escherichia coli evolve to computationally predicted growth phenotypes. Ibarra RU, Edwards JS, Palsson BO: Escherichia coli K-12 undergoes adaptive evolution to achieve in silico predicted optimal growth. Schellenberger J, Palsson BØ: Use of randomized sampling for analysis of metabolic networks. Almaas E, Kovács B, Vicsek T, Oltvai ZN, Barabási AL: Global organization of metabolic fluxes in the bacterium Escherichia coli. Thiele I, Price ND, Vo TD, Palsson BO: Candidate metabolic network states in human mitochondria: Impact of diabetes, ischemia, and diet. Kell DB: Metabolomics and systems biology: making sense of the soup. Kell DB, Brown M, Davey HM, Dunn WB, Spasic I, Oliver SG: Metabolic footprinting and systems biology: the medium is the message. Goodacre R, Vaidyanathan S, Dunn WB, Harrigan GG, Kell DB: Metabolomics by numbers: acquiring and understanding global metabolite data. Lenz EM, Bright J, Wilson ID, Morgan SR, Nash AF: A 1H NMR-based metabonomic study of urine and plasma samples obtained from healthy human subjects. Allen J, Davey HM, Broadhurst D, Heald JK, Rowland JJ, Oliver SG, Kell DB: High-throughput classification of yeast mutants for functional genomics using metabolic footprinting. Nicholson JK, Connelly J, Lindon JC, Holmes E: Metabonomics: a platform for studying drug toxicity and gene function. Mortishire-Smith RJ, Skiles GL, Lawrence JW, Spence S, Nicholls AW, Johnson BA, Nicholson JK: Use of metabonomics to identify impaired fatty acid metabolism as the mechanism of a drug-induced toxicity. Sabatine MS, Liu E, Morrow DA, Heller E, McCarroll R, Wiegand R, Berriz GF, Roth FP, Gerszten RE: Metabolomic identification of novel biomarkers of myocardial ischemia. Cakir T, Efe C, Dikicioglu D, Hortaçsu AKB, Oliver SG: Flux balance analysis of a genome-scale yeast model constrained by exometabolomic data allows metabolic system identification of genetically different strains. Bang JW, Crockford DJ, Holmes E, Pazos F, Sternberg MJ, Muggleton SH, Nicholson JK: Integrative top-down system metabolic modeling in experimental disease states via data-driven Bayesian methods. Oliveira AP, Patil KR, Nielsen J: Architecture of transcriptional regulatory circuits is knitted over the topology of bio-molecular interaction networks. Villas-Boas SG, Moxley JF, Akesson M, Stephanopoulos G, Nielsen J: High-throughput metabolic state analysis: the missing link in integrated functional genomics of yeasts. Moreira dos Santos M, Thygesen G, Kötter P, Olsson L, Nielsen J: Aerobic physiology of redox-engineered Saccharomyces cerevisiae strains modified in the ammonium assimilation for increased NADPH availability. Hess DC, Lu W, Rabinowitz JD, Botstein D: Ammonium toxicity and potassium limitation in yeast. Nissen TL, Schulze U, Nielsen J, Villadsen J: Flux distributions in anaerobic, glucose-limited continuous cultures of Saccharomyces cerevisiae. Famili I, Forster J, Nielsen J, Palsson BO: Saccharomyces cerevisiae phenotypes can be predicted by using constraint-based analysis of a genome-scale reconstructed metabolic network. Bonarius HPJ, Schmid G, Tramper J: Flux analysis of underdetermined metabolic networks: The quest for the missing constraints. Edwards JS, Palsson BO: Metabolic flux balance analysis and the in silico analysis of Escherichia coli K-12 gene deletions. Varma A, Palsson BO: Metabolic Flux Balancing: Basic concepts, Scientific and Practical Use. Segre D, Vitkup D, Church GM: Analysis of optimality in natural and perturbed metabolic networks. Baldi P, Brunak S, Chauvin Y, Andersen CA, Nielsen H: Assessing the accuracy of prediction algorithms for classification: an overview. Price ND, Schellenberger J, Palsson BO: Uniform Sampling of Steady State Flux Spaces: Means to Design Experiments and to Interpret Enzymopathies. Price ND, Thiele I, Palsson BO: Candidate states of Helicobacter pylori’s genome-scale metabolic network upon application of “loop law” thermodynamic constraints. Schuetz R, Kuepfer L, Sauer U: Systematic evaluation of objective functions for predicting intracellular fluxes in Escherichia coli. Patil KR, Nielsen J: Uncovering transcriptional regulation of metabolism by using metabolic network topology. Shannon P, Markiel A, Ozier O, Baliga NS, Wang JT, Ramage D, Amin N, Schwikowski B, Ideker T: Cytoscape: a software environment for integrated models of biomolecular interaction networks. Herrgard MJ, Swainston N, Dobson P, Dunn WB, Arga KY, Arvas M, Bluthgen N, Borger S, Costenoble R, Heinemann M, et al. : A consensus yeast metabolic network reconstruction obtained from a community approach to systems biology. Forster J, Famili I, Fu PC, Palsson BO, Nielsen J: Genome-Scale Reconstruction of the Saccharomyces cerevisiae Metabolic Network. Reed JL, Patel TR, Chen KH, Joyce AR, Applebee MK, Herring CD, Bui OT, Knight EM, Fong SS, Palsson BO: Systems Approach to Genome Annotation: Prediction and Validation of Metabolic Functions. Nissen TL, Kielland-Brandt MC, Nielsen J, Villadsen J: Optimization of ethanol production in Saccharomyces cerevisiae by metabolic engineering of the ammonium assimilation. Roca C, Nielsen J, Olsson L: Metabolic engineering of ammonium assimilation in xylose-fermenting Saccharomyces cerevisiae improves ethanol production. Hartman JL IV: Buffering of deoxyribonucleotide pool homeostasis by threonine metabolism. Gelling CL, Piper MD, Hong SP, Kornfeld GD, Dawes IW: Identification of a novel one-carbon metabolism regulon in Saccharomyces cerevisiae. Denis V, Daignan-Fornier B: Synthesis of glutamine, glycine and 10-formyl tetrahydrofolate is coregulated with purine biosynthesis in Saccharomyces cerevisiae. Hjortmo S, Patring J, Andlid T: Growth rate and medium composition strongly affect folate content in Saccharomyces cerevisiae. Kussmann MRF, Affolter M: OMICS-driven biomarker discovery in nutrition and health. Serkova NJ, Niemann CU: Pattern recognition and biomarker validation using quantitative 1H-NMR-based metabolomics. From botton to top,6th reference: Homeostasis? Do you really now what homeostasis is?